No newsflash here, the job market has been difficult at best over the past few years but here’s a little good news. Discovery Channel is conducting a search for a newly created position within the company, Chief Shark Officer (CSO). The CSO will preside over this year’s Shark Week and to say the job requirements are interesting would be an understatement. Job Requirements: Must enjoy exotic, waterfront locations, buff bodies in bathing suits and having the bejesus scared out of you. Looking delicious in a wet suit is a plus. Sense of humor required. Hmm I don’t look too bad in a wet suit but the “having the bejesus scared out of you” portion provides pause. Looking further into the job duties reveals why you must have a steely resolve and no I am not referring to hanging out with celebrities. As the CSO, you will be required to swim with sharks (accompanied by professionals, of course), attend Shark premiere parties in NY, LA and Miami (accompanied by celebrities, of course) and help spread the word about the world's most misunderstood predator. And how about the most important detail, PAY! Benefits: Lots and lots of insurance and some great dentistry, naturally. Well I might pass but if you are interested, forward "resumes, audition tapes and blood type" to Discovery Channel c/o Elizabeth Hillman. Eric is the co-founder and executive editor of the animal rights and eco-friendly news source, This Dish Is Veg. 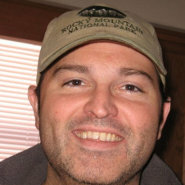 In addition to his work at TDIV, Eric is a father of three, runner, and lover of the outdoors.